Curry leaves lend an Indian influence to this Malaysian seafood recipe that will please and impress whomever you cook it for. Rinse the prawns under warm running water and pat dry with paper towels. Remove the shells from the prawns but leave on the tails. Heat 1 cup oil to 350 F. When the oil is hot, add the prawns. Briefly, cook the prawns in the hot oil until they turn pink (about 1 minute). Remove and drain on paper towels. Melt the butter in a wok or heavy frying pan over medium-high to high heat. Add the curry leaves. Cook briefly, then stir in the oil-poached prawns, Chinese rice wine, sugar, and chili paste. Stir-fry for about 2 minutes, then add the coconut milk. Heat through. Taste and sprinkle with black pepper, if desired. 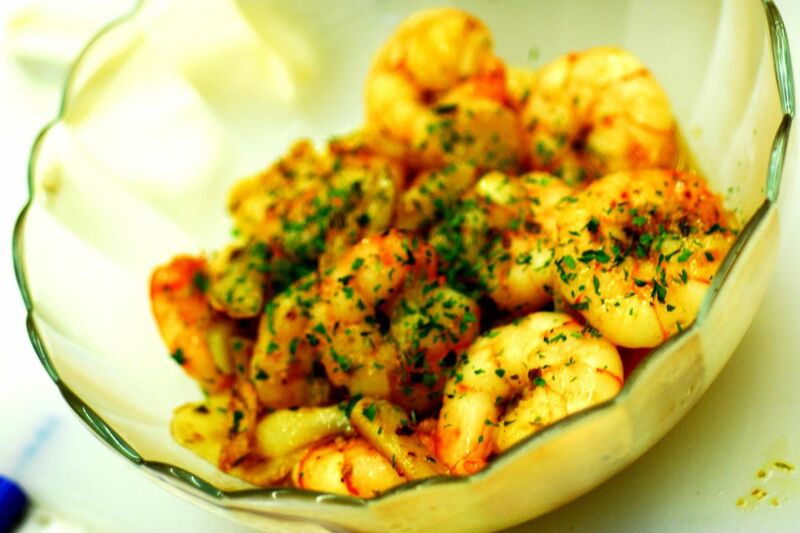 To serve, garnish the butter prawns with the chopped cilantro leaves. Each serving contains: Calories 354, 2 g Carbohydrates, 19 g Protein, 30 g Fat, 237 mg Cholesterol, trace Fibre, 210 mg Sodium, 210 mg Potassium.